Gestational choriocarcinoma can present with widespread haemorrhagic metastatic disease that may bleed heavily. We present a case of choriocarcinoma with life threatening bleeding from a splenic metastasis which was successfully managed with splenic artery embolization. A 28 year old female presented 9 weeks after the term delivery of a healthy baby with severe abdominal pain, shortness of breath and headaches. A CT scan indicated the presence of haemoperitoneum and metastases in the liver, spleen, kidney and brain. The serum hCG level at presentation was elevated and reported as being greater than 225,000IU/L, the upper limit of the assay used. An emergency laparotomy controlled the bleeding from a large liver metastasis and the pathology confirmed the diagnosis of choriocarcinoma. 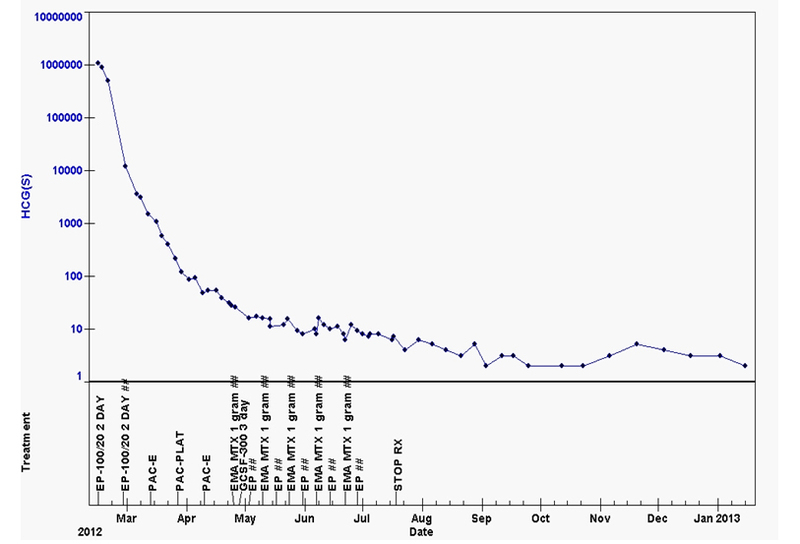 On transfer to Charing Cross Hospital, combination chemotherapy was started urgently with a prompt symptomatic improvement and rapid fall in the hCG level. However the splenic lesion continued to bleed and threatened to rupture the grossly expanded splenic capsule. A selective splenic artery embolisation of the bleeding arterial pseudoaneurysm was performed with excellent haemostatic control. Following the procedure, combination chemotherapy was continued for a total of 5 months treatment and now 3 years on from treatment completion the patient remains well and is almost certainly cured. Patients with choriocarcinoma can present with significant haemorrhage which can be require expert multidisciplinary team management. Selective arterial embolisation can be life saving and should be considered in other similar cases. Gestational trophoblastic disease comprises a spectrum of benign and malignant lesions, ranging from complete and partial molar pregnancies through to the aggressive malignancy choriocarcinoma. All of these diagnoses arise from the cells of conception and make human chorionic gonadotropin (hCG). Cases of choriocarcinoma are very rare with the incidence estimated at 1 per every 50,000 pregnancies . Choriocarcinoma is a very vascular tumour and frequently metastasizes with the lungs, liver and central nervous system (CNS) the most common sites of disease. As a result of the high vascularity, tumour biopsy can be dangerous and in most cases the diagnosis can be safely made clinically based on the history, imaging and elevated hCGlevel. Tumour associated neo-vascularisation occurs as a result of the high levels of hCG produced within the tumour and can result in the formation of Arterio-Venous Malformations (AVMs) that may bleed heavily . Despite the rapid growth of the choriocarcinoma cells and their high ability to metastasise, modern treatment is routinely curative with combination chemotherapy delivering cure rates in excess of 90% . In this report we describe the case of a patient with choriocarcinoma with brain, liver, lung and splenic metastases who underwent emergency embolization of a segmental splenic artery pseudoaneurysm within the splenic metastasis to control life threatening bleeding. After this successful procedure the patient completed chemotherapy, remains in remission and is almost certainly cured. A 28-year-old caucasian female para 1, gravida 1, presented to her local hospital, 9 weeks after a full term delivery, complaining of severe abdominal pain, shortness of breath and headaches for the previous 3 weeks. She was previously fit and well without any prior medical history, was taking no regular medication and had no family history of note. The initial investigations showed a haemoglobin level of 4 g/dl whilst a CT scan of the chest, abdomen and pelvis revealed a haemoperitoneum and widespread metastases to the liver, spleen and lungs with bilateral pleural effusions. The CT scan of the head demonstrated a solitary bleeding brain metastasis in the right temporo-occipital lobe. The patient was transfused and then underwent an emergency laparotomy during which a liver biopsy was obtained. The histopathology confirmed the diagnosis of metastatic gestational choriocarcinoma with malignant cytotrophoblasts and syncytiotrophoblasts which stained positively for hCG, CD10 and CK but were AFP negative. Post operatively the patient was transferred urgently to the UK National Trophoblast Tumour Centre at Charing Cross Hospital in London. On admission, the serum hCG level was 1,039,437 IU/L (normal <5 IU/L). Within an hour of arrival emergency chemotherapy was commenced with two days of low dose etoposide and cisplatin, with treatment supported with dexamethasone and tranexamic acid. After a brief episode of neurological deterioration, resulting from further haemorrhage from the brain metastasis, the patient’s clinical condition stabilized and the hCG levels started to fall. During the second week of admission the patient reported increasingly severe epigastric and left upper quadrant pain associated with nausea and vomiting. An updated CT scan of the abdomen, shown in Figure 1, demonstrated active bleeding from extensive metastatic tumour infiltration of the spleen, an underlying segmental splenic artery pseudoaneurysm and severe distension of the splenic capsule with an impending risk of capsule rupture. A review between the clinical teams confirmed that surgical intervention was not possible and the decision was made for the interventional radiology team to attempt embolisation via the splenic artery. Figure 1. 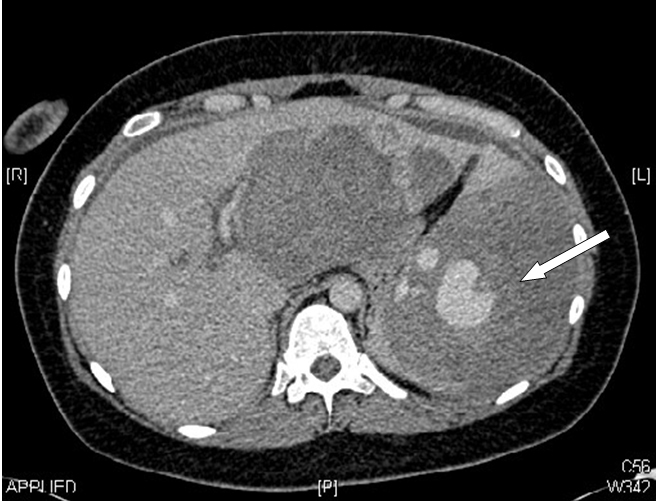 CT abdomen showing intrasplenichaematoma and pseudoaneurysm (arrow) formation in the spleen as well as metastatic deposits in the liver. Selective injection into the segmental splenic artery at the time of the procedure demonstrated neoplastic pseudoaneurym formation centrally within the spleen secondary to direct invasion by tumour and destruction of the segmental arterial branches of the spleen (Figure 2). Successful selective embolization using a combination of platinum microcoils (Boston Scientific, Natick, MA, USA) and Polyvinyl particles (Boston Scientific, Natick, MA, USA) led to haemostatic control of bleeding (Figure 3). Figure 2. Splenic artery angiogram at time of embolisation, showing vessel spasm due to hypotension, pseudoaneurysm (arrow) formation and direct vessel wall invasion by the tumour with minimum neoplastic neovascular formation. Figure 3. 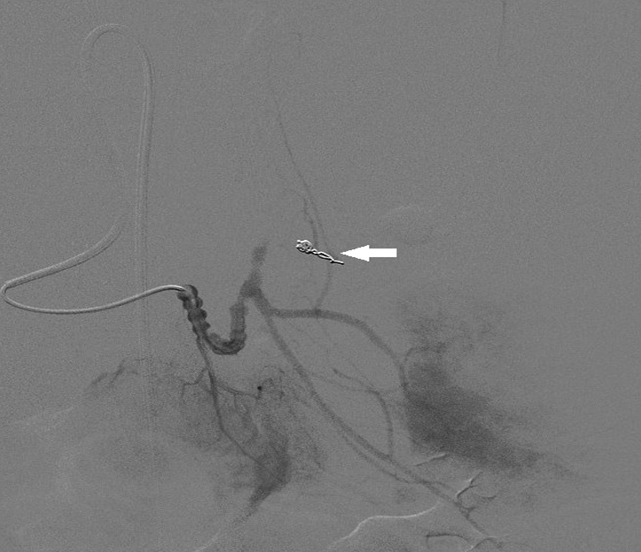 Post embolization angiogram demonstrating coils in segmental branch of splenic artery (arrow) with no filling of the pseudoaneurysm. Post procedure the patient made a rapid recovery and continued with chemotherapy using the EMA-EP (etoposide, methotrexate, dactinomycin-etoposide, cisplatin) regimen with the increased methotrexate dose to aid CNS penetration. Two weeks after the embolization, the patient suffered a pulmonary embolus and required anti-coagulation which was achieved without any significant bleeding. After continuing inpatient chemotherapy for a further 4 weeks, the patient was able to be discharged home and completed treatment as an outpatient. Chemotherapy was continued for an additional 8 weeks after the hCG levels reached normal as seen in Figure 4. On follow up, the patient remains well with normal hCG levels and is almost certainly cured. The updated imaging performed 18 months post procedure has shown a major reduction in the size of the splenic abnormalities and no evidence of disease activity (Figure 5). Figure 4. hCG treatment graph demonstrating normalization of these levels with treatment. (Abbreviations, hCG-human chorionic gonadotropin, EP- etoposide/cisplatin, PAC-E-paclitaxel/etoposide, PAC-Plat-paclitaxel-cisplatin, EMA-etoposide/methotrexate/dactinomycin, MTX-methotrexate). Figure 5. Follow-up CT chest/abdomen/pelvis and MRI brain scans performed 18 months after the completion of chemotherapy show healing of the splenic abnormality and resolution of the CNS lesion. Choriocarcinoma is a rare highly vascular tumour of trophoblastic cells which make hCG and can metastasise to nearly any site. Despite the aggressive nature of the malignancy and the frequently advanced stage at presentation the majority of patients can expect to be cured with combination chemotherapy . The localised high levels of hCG stimulate angiogenesis and can lead to the development of arterio-venous malformations (AVMs). The most common site for this process is in the uterus, where heavy bleeding can result but is usually effectively controlled with selective uterine artery embolization performed radiologically . The development of AVMs at other sites of metastatic disease has also been documented most frequently in the lungs. In choriocarcinoma metastatic spread to the spleen is relatively rare with control of bleeding risks with surgery previously reported . In this case the patient initially presented with life threatening bleeding from the liver and advanced CNS disease that were both controlled by emergency chemotherapy treatment. Despite this treatment splenic bleeding continued and became life threatening. 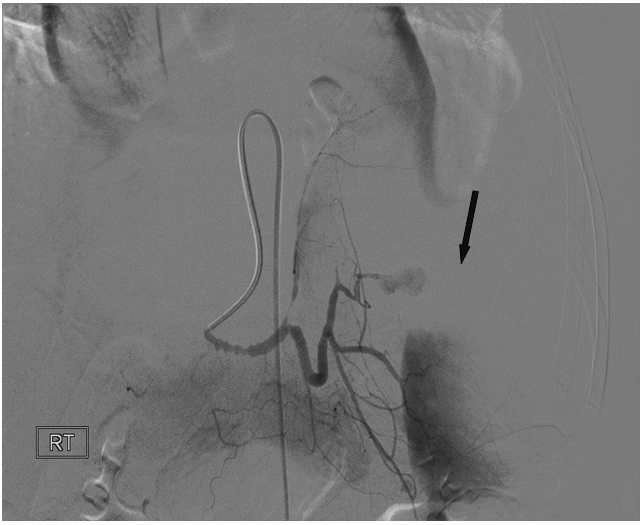 Radiological embolization of a segmental splenic artery pseudoaneurysm was performed with a combination of embolic particulate material and platinum microcoils. This procedure achieved complete thrombosis of the pseudoaneurysm with maintenance of the circulation to the non-tumorous spleen. The left upper quadrant pain secondary to splenic capsular distension resolved almost immediately. Whilst there is considerable published experience in splenic artery embolization for patients with splenic trauma this was the first time this procedure has been performed at our institution on a splenic pseudoaneurysm secondary to direct tumour invasion of a segmental splenic artery . Charing Cross Hospital is one of the largest trophoblasttumour units in the world and we are not aware of any other similar reports in the literature. 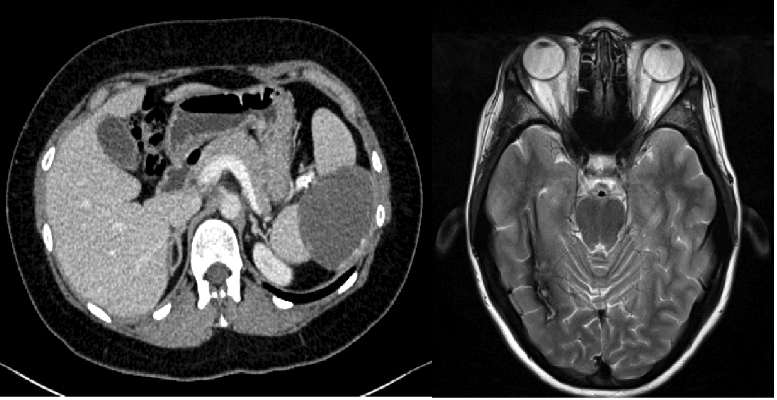 The most immediate life threatening risk for many patients with choriocarcinoma is from bleeding from the uterus, CNS metastases, AVM or in this case a pseudoaneurysm. In contrast, thrombo-embolism is also a serious risk and adds to the mortality risk. In similar patient populations with prolonged immobilization and increased thrombotic risk due to the use of tranexamic acid and cisplatin based chemotherapy there should be a low threshold for the insertion of a prophylactic IVC filter that can be removed after treatment is completed [8,9]. Gestational choriocarcinoma carries an excellent prognosis with the use of combination chemotherapy even when patients present with advanced metastatic disease. Whilst deaths from chemotherapy resistant disease can occur, bleeding and thrombosis can present life threatening risks during the earlier stages of treatment. In this case we have shown how radiological embolization of a splenic artery pseudoaneurysm can be lifesaving and discussed how the risk from thromboembolism can be minimised. Nethra S, Hawe J, Elder J (2011) Splenic rupture: a rare presentation of metastatic choriocarcinoma. Gynaecological Surgery 8: 435-437. ©2015 Galazi M. This is an open-access article distributed under the terms of the Creative Commons Attribution License, which permits unrestricted use, distribution, and reproduction in any medium, provided the original author and source are credited. Charing Cross Hospital, London W6 8RF, UK, Tel 0203-311-1419; Fax 0203-313-5577.